"Willkommen" "Don't Tell Mama" "Perfecly Marvelous" "Two Ladies" "Tomorrow Belongs to Me" "If You Could See Her" "Cabaret"
“Cabaret” made audiences an offer they might want to refuse — an invitation to Berlin’s seamy, sleazy Kit Kat Klub, on the eve of Hitler’s rise to power in Weimar Germany. Based on Christopher Isherwood’s BERLIN STORIES, the show depicted the interlocking stories of a cabaret singer, a writer from America, and the denizens of Berlin, all caught up in the swirling maelstrom of a changing society. The musical was a challenge to Harold Prince, who was the show’s producer as well as its director, and he worked closely with his songwriting team, John Kander and Fred Ebb. The team initially began the show with an extended cabaret sequence hosted by a Master of Ceremonies, but that far overshadowed the book’s story of second-rate chanteuse Sally Bowles. Eventually, the collaborators integrated the cabaret numbers to comment on the action of the story and the raw edge of the material made “Cabaret” the most provocative and challenging musical of its day. 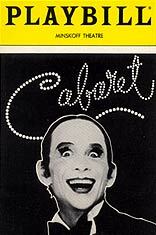 It launched the careers of its creators, and that of Joel Grey as the eerie, omniscient MC. A dramatically refocused film version, helmed by Bob Fosse in 1971, only burnished the show’s legend, and two subsequent Broadway revivals have turned this penetrating gaze at a troubled era — “it’s about people dancing on the edge of a cliff and not quite falling over,” said Ebb — into a timeless classic.